Are you planning to buy Windows 7? Do you know which edition of Windows 7 to buy an Upgrade or Full product? We've received so many questions related to "buy Windows 7 upgrade." In this article you will learn everything about buying Windows 7 edition of Home Premium, Professional, Ultimate and/or Family Pack. Should I buy windows 7 upgrade or Full product? All editions of Microsoft Windows Vista and Windows XP qualify you to upgrade. So, if you're running either on your computer, then you buy a package labeled "Upgrade." Suppose, if you have Windows XP Home edition installed on your PC then you purchase Windows 7 Home Premium upgrade not the full product. Buying Windows 7 upgrade version over full product could save you $80 or more. Can I buy Windows 7 online? The answer is yes. You can buy Win 7 online directly from Microsoft's store. 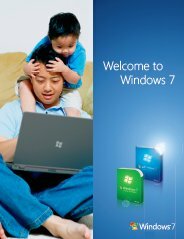 The advantage of buying Windows 7 online from Microsoft's store is that you can download Windows 7 software right away and avoid shipping -it's better for the environment and better for your wallet-, you can download Windows 7 operating system again whenever you want. If you would like to save some money then you should visit and check other online websites such as Amazon or Newegg, sometimes you could save at least $10-15. But, you have to wait 5-7 days to get the Windows 7 CD by mail and upgrade or install windows 7 on your computer. Where can I buy Windows 7 Starter edition? Well,you can't find Windows 7 Starter edition at the retail stores as it can only come to user as preinstalled OEM version with new notebook computers worldwide. If you're MSDN subscriber then you can download Windows 7 Starter edition DVD/ISO image, Windows 7 Starter is available in 32-bit (x86) while other versions are available in both 32-bit (x86) and 64-bit (x64) versions. Buy Windows 7 Family Pack! Family Pack edition of Windows 7 provides you with three licenses of Windows 7 Home Premium Upgrade, you can Upgrade three computers in either 32- or 64-bit. Windows 7 Home Premium Upgrade Family Pack's package contains one disc with a license key that can be entered on as many as three PCs. So, if you've more than one PC at home and planning to upgrade Windows Vista or Windows XP homed edition to Windows 7 Home Premium then you should buy Windows7 Home Premium Upgrade Family Pack and save more than $200.